SR114 MILLS CONGRESS - Memorializes Congress to review and amend or revise the Biggert-Waters Flood Insurance Reform Act of 2012. SCR60 LONG COASTAL PROTECT/RES AUTH - Requests federal, state, and local governing authorities when contracting for coastal restoration and protection projects to give priority to Louisiana businesses. 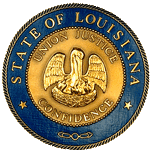 SCR82 G.SMITH WILDLIFE/FISHERIES DEPT - To urge and request the Louisiana Department of Wildlife and Fisheries to perform a study determining how local governing authorities can regulate air boat noise pollution. SCR91 ALLAIN CONGRESS - Memorializes Congress to prevent unnecessary and unintended harm to coastal communities, individuals, and businesses by immediately amending the Biggert-Waters Act and mandating revision of FEMA flood-risk maps.